In the very near future, China, now the world's largest industrial producer and consumer of Mideast Oil, passes a law that all new cars manufactured in that nation will be operated on natural gas. Beneath the floor of the South China Sea, around the contested Spratly Islands, billions of gallons of natural gas wait to be mined. But at the center of the Spratlys, the remote but strategic island of Itu Aba is occupied by China's historic enemy, Taiwan. When the new, power-hungry Chinese President, Tang Qhichen, orders Chinese Naval forces to attack Taiwanese forces on Itu Aba, U.S. President Douglas Surber responds, ordering the U.S. Seventh Fleet to try and quell a burgeoning naval showdown between the two Chinas. Aboard the submarine tender U.S.S. Emory S. Land, one of the first ships in the naval war zone, is Ensign Stephanie Surber, a recent Naval Academy graduate who is also the First Daughter of the United States. As the Emory S. Land steams into harm's way, Ensign Surber's life is gravely threatened. The President must make a decision. Will he take a stand against evil? Or will he save the life of his daughter? 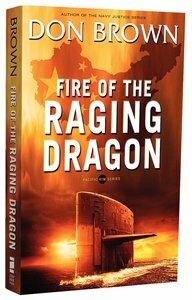 About "Fire of the Raging Dragon (#02 in Pacific Rim Series)"